One thing that a lot of parents know too well and are unhappy about is that children simply don’t like to eat healthy food. Give them chocolate any time of day and they’ll devour it in a second. They’ll joyfully have it for breakfast, snack, lunch, second snack and dinner. But give them lettuce, beet salad, vegetable soup, or anything rich in vitamins, they’ll make disgusted faces and turn their heads away. If we know child psychology a little, we know that approaching children with fun projects is often the way to get them to do something they don’t want to. Healthy eating is one of those things. Have you tried making an airplane out of vegetables? It would probably be fun and easy to navigate the airplane into your child’s mouth, but who has time to make food toys for every meal? There are easier ways to get your child interested in what’s inside a food packaging. For example, parents could really use these fun sticky food labels for that purpose, especially lunchbox stickers. Sometimes children trust animated characters more than real people. When an animated character says that spinach makes you strong and fast, the child is more likely to eat spinach. So how about labeling your child’s lunch food with sticky fruits and vegetables that have smiley faces? You could also invent and tell your kids a story about a Smiley Broccoli who always eats everything his momma packs him for lunch, and your children could easily warm up to the idea of eating green, healthy stuff that’s waiting for them in their lunchbox. It’s worth a try. This collection of label printables also includes Easter stickers that don’t have to be used only for Easter. These cute bunny labels could come to rescue when smiley produce is not working out. Simply use the blank space to write out your child’s name or some sort of food dare (for example: “How quickly can you eat ALL your lunch?”). For starters, make a list of questions that might inspire kids to eat healthy food, and then work the bunny label magic on your child. 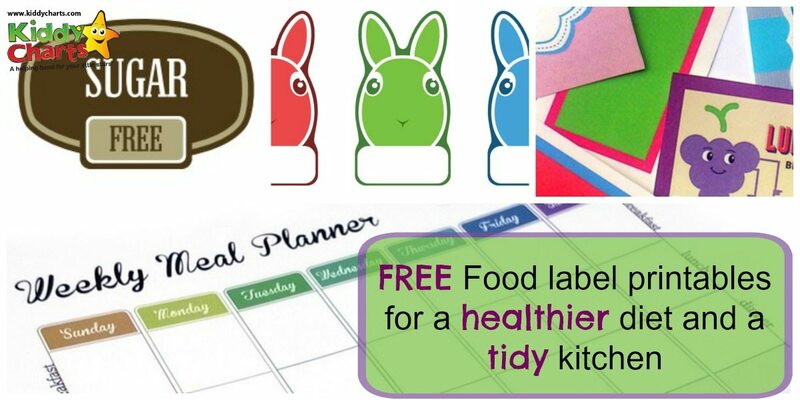 This collection of food label printables also includes handy stickers for organizing the kitchen and pantry. Worrying about your child’s nutrition, cooking healthy meals and devising playful ways to get kids to eat those meals can be so time-consuming that the kitchen, and especially pantry, often suffer. After some time of mindlessly stocking your pantry with purchased food products, it gets difficult to find the most basic ingredients. This weekly meal planner is the first step to becoming more organized in the kitchen and disciplined about your family’s eating habits. If you are super disciplined, you can fill out all the blank spaces and strictly adhere to the plan for what to eat for breakfast, lunch and dinner each day of the week. However, due to our busy schedules, it usually won’t be possible to stick to the plan completely. Still, it’s enough to use the planner as a general meal guide and a reminder for eating healthy food. Pantry labels are great for labeling products most of us have in our pantry: flour, sugar, rice, cereal, etc. Once you clear up unnecessary items from the pantry and organize the food on pantry shelves, it will take you a second to spot what you are looking for. If you are allergic to some types of food or extra careful about what you eat, it’s a good idea to label all food packaging with proper healthy food tags. This way you can separate “regular” food from food that’s lactose-free, organic, suitable for vegans, etc. Finally, you can have fun with your kids placing pet food labels on pet food canisters or boxes. Not only will these stickers point you in the right direction when you’re searching for pet food in your pantry, they’re also beautifully designed and nice to look at. Sticky labels are not to be underestimated, as they can obviously be of big help in our home. Can you think of some more creative ways to use these fun label printables?